» FISHING RELATED DISCUSSIONS & QUESTIONS! So I grew up mostly panfishing at local lakes and ponds, and occasionally pier and jetty fishing. I never really bass fished as a kid, either because my dad had limited knowledge or because I had stopped fishing by the time my dad thought I had enough patience for it. I think it's a combination of the two. I say that my dad had limited knowledge because we didn't have a boat, and he rarely fished with other people, which I find is the best way to learn new things. His prime fishing days were also before the WFN channel were available on cable TV, and I never saw a Field and Stream magazine or anything come to our door. I think he was mostly self-taught, and while I think he is a great fisherman, there has to be a ceiling you hit going that route. So my goal is to further expand my knowledge, and really getting into the more detail of some techniques and tackle, and to pass it onto my kids. Spinning Setup: 7'1 Powell Max 3D 714 with a Penn Battle II 3000 spooled with KastKing 30lb braid. Casting Setup: 7'3 Powell Max 3D 736 with a Daiwa Tatula Type-R 100HS spooled with KastKing 50lb braid. I honestly don't know much about tackle, but looked a few setups from Youtube and pieced this together. After several trips with Mike and Dave, I knew I wanted to topwater fish so I got the baitcaster for frog fishing, and the spinning setup for poppers. I'm finding the 7'1 rod to be a little stiff in the tip for popping though. I took it on a trip with Mike on 8/7, and landed a lot of bass on a horny toad set up though. I'm thinking of getting a 6'6 rod with a more flexible tip for popping, but I'm not sure. As for tackle, I'm pretty much buying a few things that have worked with Mike and Dave (Ricos, Horny Toads, Zip N Ziggies, hollow bodied frogs), and also from some I've seen on Youtube. I subscribe to 1rod1reel, Extreme Philly Fishing, and Bassresource. Any others worth checking out? 1rod1reel fishes areas in Maryland that I know, so that's a bonus, and EPF is a multi-species angler that's pretty informative. My wife and kids are going to Wildwood Sunday through Tuesday, so I'll have a couple days to fish. I'm starting to plan out my attack this weekend and maybe Monday evening. I'm thinking of live-lining bluegill somewhere. Our local pond has hundreds and hundreds of stunted bluegill. They're so used to eating bread that all I have to do is put bread in a net or minnow trap and I'll get dozens. Any recommendations? 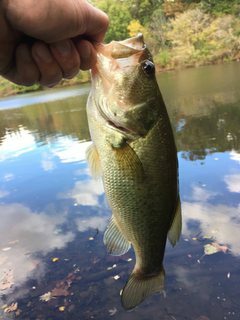 Someone posted on NE Bassfishing forums that the Widewater area of the C&O canal holds some big LMB, I may try that with my dad. My problem is that I like a rod for everything which means way too many rods. Once in a while I sell some, always priced right and in great shape. Time to go fishin' again! I'm starting to go down that route too, I fear...I just ordered Fenwick Silverhawk II 6'6 medium casting rod, and Tatula Type-R 8:1 as a popper rod. I have a 6 rod holder in the garage which is filled with some of my kids push button rods....I think I'm going to have to relocate theirs soon. I'm planning on renting a kayak and going fishing on the Mattawoman on Saturday, tide and weather look great. This will be my first time kayak fishing, and I'm worried because if I enjoy it a lot...I'm pretty sure I'll be splurging for a nice one soon thereafter which probably won't go over well with the wife unit. Together we'll fight the long defeat. So, I hit Mattawoman today. I had called Atlantic Kayak yesterday to verify they were open and that I was interested in fishing from a kayak. The lady who answered said they had a sit on top, but I wasn't expecting much. I arrived around 1:30PM, and glad I did because it they had some large camp group going through safety training. I quickly signed a liability waiver, and told them a lady said they had a sit on top fishing kayak available...the girls behind the desk had no idea, but the a guy went to the storage rack and they found it. It was a Pelican, with two rod holders, dry storage, and rear storage. I was pleasantly suprised since I was expecting a conventional kayak. My buddy went with me and this was his maiden voyage on his new Vibe propel 10. It was just past low tide, and the water was slowly starting to come into the creek. I rowed, my buddy peddled. We eventually made it past the trail wall and started to fish holes in the spatterdock and grass. I was throwing a white Keitech Noisy Flapper, and Yo-Zuri 3DB Prop shiner. I started with throwing the prop bait...I'm not sure if it's me being inexperienced in a kayak or not, but I found it difficult to throw the prop bait, mainly because I wanted to be 2-3 feet off the grass line, but the tide and wind just kept pushing me either farther away into the channel or into the grass, which really screwed up my angles along the grass edge. Also, being on a kayak, I don't get the tip at a down angle like I want to. Any suggestions or is that just how it is? I really wanted to throw this bait but I couldn't do it effectively. I eventually switched to the Keitech frog, and started to push a little farther back into pads to find holes in the spatterdock. My first hit was definitely a bass, I set it too fast...when I got the frog back and looked at it...it hadn't even come off the frog. *WINCE*; my next hit was really odd, it was an airmailed fish. I was retrieving at a medium/high retrieve...I saw the follow and kept going, and he simply wiffed at it but went airborne. I saw the outline...LMB. I think that was a first for me. Airball LMB. About 45 mins later, I found another nice hole and saw the follow from the grass, let him have it and landed a LMB. I didn't have a net, so as I was trying to bring him to the kayak, he shook off...he touched the hull so it counts! At this point I think I had them figured out today, they wanted a slow retrieve. And finally, at about 5PM, I landed a small snakehead in the back pads, slow retrieve again. Overall, it was a good day on the water. I took a lot of what I learned from Mike and Dave, and was able to apply some of it on the kayak. I basically looked for nice holes in the pads and grass, picked a spot in the spatterdock to use as an "anchor" for the kayak, and slow retrieved the frog. We went all down toward the split to Mason Springs, before heading back...at 5:45PM, I had to get the kayak back by 7PM. I got back to the dock at 6:45 and that was paddling the whole way with no breaks...my arms feel like jello. That was a tough slog back against the tide and wind. So that brings me to whether or not kayak fishing is for me. There are certainly some techniques I see myself being able to do on them, and lacking for others. I'm not sure I would be able to commit to a higher-end fishing kayak right now, and in my mind, with all the things I would want...it would probably add up to be about the same price as a decently equipped jon boat or skiff. I need more trial and error I think. Also that being said, fishing with Mike and Dave is WAY better on the Mattawoman...they do all the work and I get to catch fish and eat ribs and chicken. The markings on that fish are gorgeous. The smaller PP always have better markings than the larger fish. Yes, they're absolutely gorgeous (IMO). I'm envious of those guys who keep them in 300gal aquarium's on youtube. 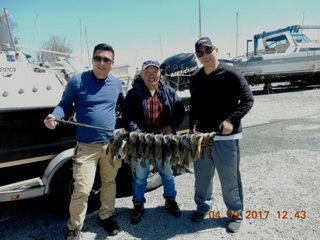 I took my dad out fishing twice today. At 7AM, we went to the DC Tidal Basin. The plan was to live-line some small bluegill for LMB or catfish, but that didn't pan out. I had put a minnow trap with bread in my neighborhood pond last night. I know the BG eat bread because that's what everyone feeds them and what my kids use on a size 12 hook to catch them. This morning I pulled it up and had about a dozen 6" mudcats, no bluegills. So I put them back in and headed out with no live bait. We got there around 7:30, and the tide was still coming in. My dad used a pumpkin creature bait, and I used a Strike King Jig (Black/Blue), and Havoc PitBoss trailer (june bug 4"). I got 3 hits, not sure if I tried to set prematurely or they were small. Jigs are new to me, but it seems like they would have been perfect for the Tidal Basin. We left at 10AM and grabbed some Soup Dumplings (Xiao Long Bao) at Shanghai Taste in Rockville. After a nice afternoon nap, which was possible because my wife went to Wildwood with the boys for a long weekend, I called my dad and see if he wanted to go to the C&O canal. It was a beautiful day, so why not. We parked at Angler's, and walked to the right toward the Widewater area. It was my first time fishing there, and it definitely looks like it holds nice bass. On the shoreline of the path, the water is visible for about 6 feet, then drops down to being not visible. So I estimate it goes from about 6-10" (visible) water, to 4-5 feet at the ledge. I wasn't really sure how to fish that so I started with some top water poppers, it was about 6PM, no wind, and very calm water. I got no hits on the poppers, but 1 huge LMB followed from the drop off and turned around when it became into the visible water. It was following a Yo-Zuri 3DB lavendar ghost shad. I think the right lure to throw here would have been a crank bait or jerk bait. Any ideas how to fish that kind of area? I took the kids out to Lake Whetstone this weekend. It's an extremely family friendly spot. I had some red worms for the kids, this was their first time using live bait. They've been practicing baiting their own hooks (size 10) with bread at our local pond, and I was curious how they'd do with the worms. I showed them how to put it on a size 6 hook, and then let them try. They did really well and they each got a couple bluegill fairly quickly. And then they went on the paddleboat. That let me do some of my own fishing and I managed a 1lb'er on a texas rigged pink super fluke. I'm tempted to take the next 1'ber I catch here and put it on my local pond. I also got out to Mattawoman on Sunday. Once again, I rented a kayak but planned to stay closer to Slavins to get more fishing in. I hit the area of pads across the channel from the beach. I spent about 2 hours there just as hightide was moving out, so there was still plenty of water in the pads. Not a single hit...barely any signs of baitfish or anything. It was very windy, gusting around 20mph, and probably a steady 10-12 as the weather was transitioning from sunny to cloudy. I wish there was more activity, but finally gave up and paddled farther toward the hiking trail wall and hit the pads just past it. I think Mike and Dave call it the pond. I was there for about 1 hour while there was barely enough water to fish some holes. I had 2 major SH blow ups. The first one I saw coming from behind some grass, I let him have it, and tugged hard. Then it pulled a Baryshnikov and it went airborne...It was like slow motion. It was dark and I'd say about 30", and I think it winked at me in the air, then the hook pulled out. The second one was just as I was about to leave, there was a large open area, I casted on one side and as I was reeling, I looked away...heard a splash and my frog was gone, I yanked and again...this one also was a student at the Russian Ballet, and went airborne. It was a smaller one with a nice pattern and I never really got a hookset. I don't think I could have done anything better on the first one, but the second I just wasn't paying attention and probably pulled the hook when I heard the splash instead of letting him have it. Any ideas how to fish that kind of area? I'm tempted to take the next 1'ber I catch here and put it on my local pond. Yep that's what I'm going to try next, I bought a couple Lucky Craft suspending jerkbaits. I follow all MD regs as best I can. It is illegal to introduce any fish species into Maryland waters except bait fish on a hook for angling....A permit is required to stock fish into any Maryland waters, including private ponds. Contact customerservice.dnr@maryland.gov or call 410-260-8300 for more information on registering and obtaining a permit. The permit application looks pretty basic, so I'm going to submit one. Went to the Widewater area of the C&O canal Saturday morning for a couple hours. The conditions seemed right for top water poppers, 9AM, cloudy, 2-3mph breeze, about 65 degrees. I was throwing the popper about parallel to the drop off that's about 5-8' from the bank. I think a few bluegill nipped at the tails of the poppers since I saw it bob up and down a couple times, but no LMB. Then I switched to some Lucky Craft Pointer 100's. They looked amazing going through the water, and I tried a couple different cadences...still no bites. Left around lunch and grabbed some Mission BBQ. On Sunday, I got out in the morning at Lake Whetstone again. It was a tough bite, and everything else I previously was using wasn't working. I had just gotten some weedless chatterbaits and decided to throw that on with a 4.8" Keitech fat impact as the trailer and threw it past a laydown. The chatter bait was coming up to the surface just past the log and I saw a dark shadow follow and slam it. I was a decent 2lber. Got a few more hits around that laydown but didn't hook up, and then I had to leave for a soccer game. I've never used a chatterbait before, but I really like throwing it. I was throwing it on a 7'3 mag heavy frog rod, and it seemed to be OK. I'm wondering if I could have landed those lost fish if I had a rod with a little more tip, like a 7'1 MH/F casting rod. Chatterbaits are awesome. Med-MH rods work fine. A little give is good, like a crankbait. Went to Gunners Lake in Germantown on Saturday from 2-4PM. The water was very clear, but there was lots of vegetation...mostly stalks of green hair algae (not sure what it's really called), so anything you threw in the lake was going to pick up algae. I didn't bring much tackle, but I tried a weedless chatterbait and weedless Keitech swimbait. I saw one bass but it was not interested. Not sure how to fish this lake, but I think next time I'll try a horny toad through the open pockets of algae grass. I hit up Lake Whetstone with the kids again Sunday afternoon. I think I have this lake figured out pretty well. I ended up with a 1.5lber pretty quickly using an weedless underspin with a Colorado blade (Venom Lure Slideblade) with a Keitech Swing Fat Impact 4.8" green pumpkin. There's one laydown that's accessible near the path on the right, and I flicked it just past the laydown...before I even took up the slack, the line was moving right and I set the hook. Water level was pretty low and very stained. Went out to Lake Centennial today around 1PM with my dad. I wanted to get out earlier but my dad couldn't, by Noon, winds were gusting around 30-40mph so I knew we were in for a heck of a day. 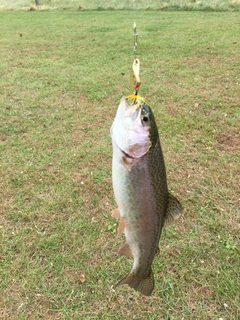 We fished near the riprap dam and I wanted to target trout and crappie, and maybe bass so I brought my medium light baitcaster that I use for jerkbaits. I put on a gold Mepps XD, and on cast 2 got a nice rainbow trout in a wind protected cove. I spent another 30 minutes there hoping to get some more, but got nothing. So I casted along the dam riprap with the Mepps, and got snagged and lost it. Then I tied on a Lucky Craft Pointer 100 jerkbait hoping for some bass along that wall, and several casts later, I got snagged and lost that too. By then it was about 3PM and it was gusting way too hard to throw anything light. I'm too inexperienced to know where to target fish in those conditions, but my gut says they would be in less turbulent waters, such as the protected cove where I caught my trout. Also, I'm kind of hestitant to throw jerkbaits or crankbaits in riprap because I feel like I lose a lot of lures, and I'm have flashbacks of losing all my dad's lures again, but everything I've read is that fish hit when those lures bump into that stuff. My rod is a Daiwa Tatula 6'9 ML-Moderate rod, do I need more deflection to not snag up or is it just bad luck. Nice trout! They stocked that lock nearly a month go and that guy managed to not get caught by anyone, until you came along lol. I miss fishing the hoco rivers for trout...Sorry I don't have any advice fishing under those conditions. Slow rolled spinnerbaits or even chatterbaits would work on a wind blown rocky shore. For trout, I do not know. Bouncing cranks in rocks is risky, but can catch fish. Well, I think today was the last hurrah for 2017. Looking back, I had a really fun year of fishing. I've learned some new techniques, learned some new spots, and know there's still much more knowledge to gain. 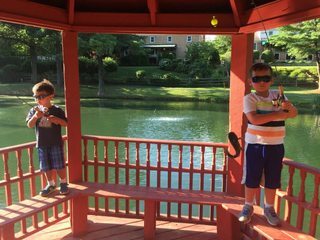 I'm getting my sons more into fishing, and I'm going to ween them off just putting a nightcrawler on a bobber and waiting for a fish. I'm going to have them start to fish small jigs and to keep practicing casting. I took them out today, and had them rigged up with 1" Gulp Alive minnows on a trout magnet under a bobber, but it was just too windy and cold so we didn't stay out long. I think my next rod will be a flipping/pitching rod, but I honestly don't think that's a necessity because I usually fish from shores/docks in light to no cover. Then I'm not sure what else I would get, maybe a crankbait rod, but I don't really like fishing those right now. 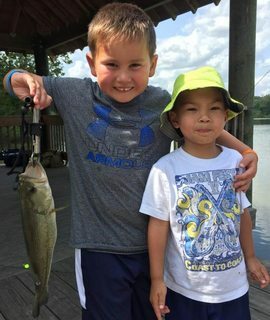 - Take the kids fishing on a jon boat more often, I have Little Seneca Lake and Clopper Lake pretty close to me to rent jon boats. I asked my wife to get me a trolling motor and batter for X-mas. - buy a fishing kayak to get out on different bodies of water, other than my local ponds. I have my eyes on the Old Town Predator PDL. 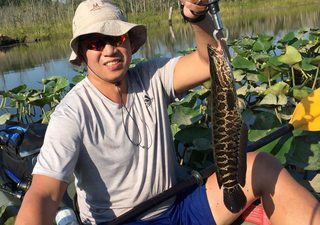 - Catch a new personal best large mouth and snakehead. - Learn how to cast right, reel left on my spinning rods. I currently cast left, reel right, just like I do for my baitcasters, but flipping the bail is all the way on the other side of the rod and it's a little inefficient. I can cast right, and actually prefer to cast right with finesse techniques, but I can't reel with my left hand well. Plus whenever I use Mike and Dave's rods, I have to change the reels...which probably annoys their next customer to use that rod! Thanks for the advice this year, and I'm looking forward to 2018! And the tackle monkey definitely got the better of me this year. The tackle monkey never goes away...stay away from fly fishing! It's all good....those 2 Captains are easy to work with! Well, I think my 2018 was off to a slow start because of the cold March and April. All my spinning rods are now left hand retrieve and I'm really comfortable with my set ups now. Instead of a kayak, I bought Curly's boat in late March to get the boys out on the water. Between the cold spring, and my company's 12/31 and 3/31 financial statement closes, I was really busy at work and I just finished getting the trailer inspected, titled and registered today, the boat was done in early April. During the winter, I wanted to learn how to fish the Ned Rig. So after getting the trailer registration done at the MVA, I headed just a couple miles to my go to spot, Lake Whetstone. I used a 1/16oz mushroom head jig with a green pumpkin TRD worm. This was just over 1lb, and had the funky black spots. I also hooked 3 more dinks but I got a little too impatient and tried to flip onto the bank and they all came off right at the bank. It took me a while to get the technique down, but it seemed that yo-yo'ing the TRD, then swimming it back slowly, then pausing was the ticket. I'm enjoying the Ned Rig on a light spinning set up, I think it's something my oldest son will be able to do too. Needed to break out the baitcaster because I got tired of flipping the bale. BFS is probably coming soon...small guy on a 3/8oz fishhead jig underspin and a fat albert grub. I really like this Coolbaits underspin, but lost it near a laydown. I'll be ordering more of these. And the biggest of the day, a female with eggs that was over 2lbs. on a 4.8" Keitech Swing Fat Impact. The Ned Rig caught more, but the Keitech always gets the biggest fish.